This macaroni and cheese box review was inspired by a trip down the pasta aisle. I found myself amazed at all the different products. Organic! Numbers! Bunnies!! No artificial colors and flavors!! This was not the Kraft Mac and Cheese of my college days. Two million boxes are sold every day of this cheesy product and I decided to see if I could discern the best choice. But, before I get into my review, we need to discuss a New York Times story on the chemicals found in boxes of mac and cheese. A consumer advocacy group found phthalates in 10 different brands (including organic) of boxed mac and cheese. Unfortunately, they didn’t say how much there was (they did say 4 times what is found in regular cheese) and so it isn’t clear if this is a health risk or how much of a health risk these products pose. There is strong evidence that phthalates block the production of testosterone so there is reason for concern. My thinking is that the jury is still out on this one and I wouldn’t fear macaroni and cheese boxes. But, I probably wouldn’t eat it every day as a result of this study. Do people eat this every day? This is the STANDARD Kraft Macaroni and Cheese dinner. Somehow it has no artificial flavors, artificial preservatives, and no artificial dyes. It doesn’t have cheese either! Did you know that it is made with “cheese sauce mix”? AAAH yes. There it is the famous dried cheese sauce mix that is so orange that I don’t need PhotoShop to make it pop. You mix it with butter and milk and it runs 350 calories for 1/3 box. Honestly, it doesn’t taste like cheese to me at all. I don’t know what it tastes like but it is bland, salty (570mg per serving), and strange. How did I eat this in my 20s? I was broke and I would mix tuna in it. Maybe I just didn’t notice because I was so hungry. 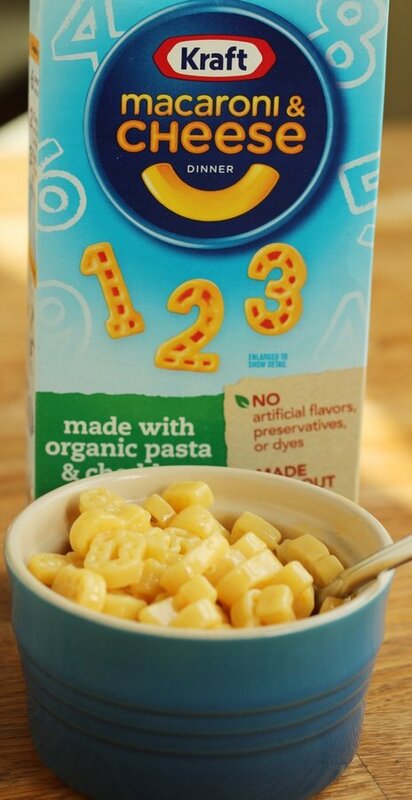 Kraft also has this product which includes organic pasta and cheese and has number shapes. It costs about twice as much and is 5.5 ounces instead of 7 (just two servings in this one). I was really excited to see that this product includes REAL CHEESE. It takes twice as long to cook the pasta (about 10 minutes) and you mix in less butter and milk. It has 360 calories and 570 mg of sodium per serving. This one tasted much better – actually like cheese! The pasta was also less mushy and more substantial. But, it was very bland and salty (again). Annie’s is made with organic pasta but NOT ORGANIC CHEESE (but there is real cheddar cheese in the box). 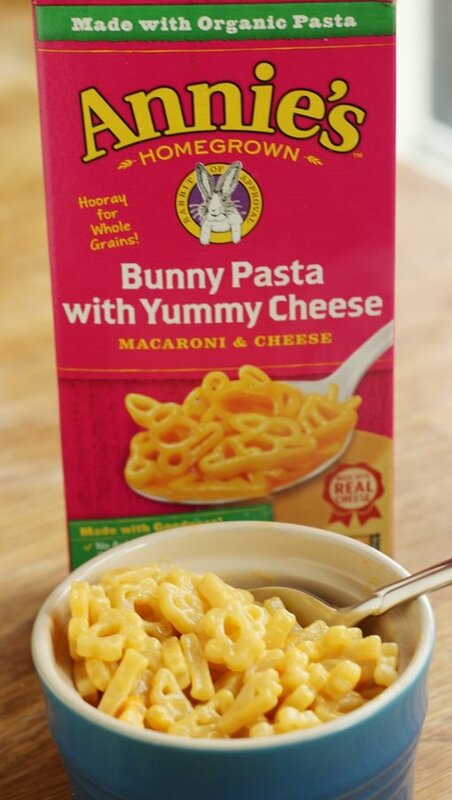 They do use some organic whole wheat flour in their pasta but the bunnies are not 100% whole wheat. This one has 400 mg of sodium and 260 calories per serving and there are 2.5 servings in a box. I did notice that this one was less salty than the Kraft version and tasted like cheese. It was bland, the pasta was good, and less salty making it the best of the bunch. I think you would probably save money and have a better experience by purchasing and cooking a decent pasta, adding some olive oil or butter, and dusting with grated Parmesan cheese and hitting it with some black pepper. None of these boxes tasted like real mac and cheese to me and they all left me with a bitter aftertaste that I couldn’t shake. The boxes are cheap, fun, and kids love them but I am not convinced they are a good value. 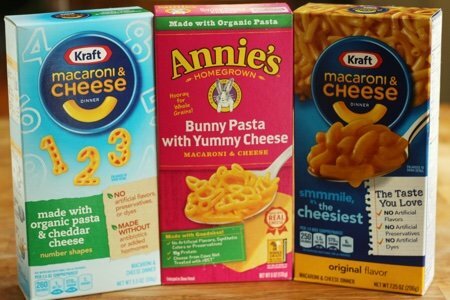 Have you tried different macaroni and cheese box brands? Have you found one that you like? I think they are all terrible. I haven't tasted one I like yet. Nothing like crust on the top oven baked real cheddar mac and cheese! I love Mac and cheese! I’ve had it all over the world but nothing has ever beaten the taste of Kraft Mac & Cheese for me. I grew up eating it and still love it at 67. To get fancy, cook some hamburger, add diced or stewed tomatoes irs, and then fold in the cooked Mac and cheese. Delish! I always kept Kraft Mac and Cheese on hand when my kids were little and needed a quick supper, usually with grill Hot Dogs and apple sauce. I have always made my own with a cheese sauce. Now my son makes my recipe from scratch for his family. I recently tried Cracker Barrel oven baked Mac and Cheese with white sauce. It comes in a bag. May husband and I found it had a strange taste not very good. With left overs, I added more cheese and some pepper. It tasted better, but I won't buy it again. I looked a their web site and could not find any nutrition information. Back to my homemade, which I have been making for almost 60 years. It's just processed food-like. Knowing what I've learned over the years, I wouldn't buy this type of filler 'food', knowing the science just cements that decision for me. Boxed 'food' thankfully has no hold over me, taste-wise, memory-wise, money-wise or convenience-wise. With today's fabulous array of nut cheeses, plant milk and ice 'creams', it's easy to find a substitute for cow stuff. It doesn’t take long, usually 30 days to make the adjustment. There was a time I enjoyed an occasional Kraft Mac ’N Cheese with add-ins, so I get that it’s still popular. I'm happy you profiled this popular product, Lisa; it made me check to see what Dr. Greger had to say about the latest research on phthalates. Very interesting and as usual, convincing. Several of the studies point to sexual development issues for boys. No matter what I read these days it’s like M. Pollan said, ‘’eat food, mostly plants, not too much’’. My daughter will only eat boxed macaroni and cheese .....won't go near homemade. My grandkids love homemade. Its a comfort food from my chikdhood. I gave up smoking drinking and soda thus stays on the list. But I do eat it only on really bad emotional days that I need comfort. 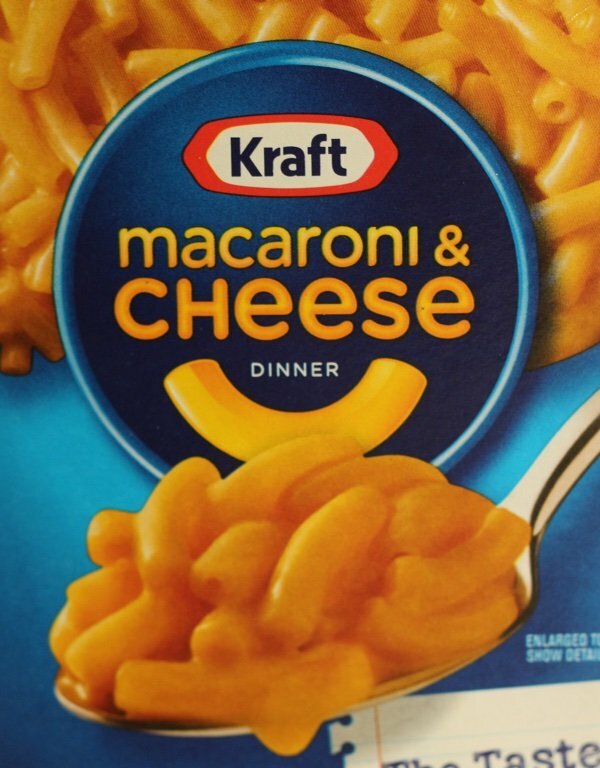 Sorry to say I grew up on Kraft’s also and still love it to this day - although I seldom eat it. We always mixed it with cream of Mushroom soup, tuna and peas and baked it - my kids (adults) still love it too. The one at Trader Joe’s is supposed to be great and one of their best seller’s - will try it one of these days. Like I said - the stuff is not that good for you but honestly I have made my own and still like Kraft better. Makes no sense I know -must be a child hangover thing. Horizon makes an excellent organic and non organic Mac and cheese. We don’t have those in Canada but I always grab a few boxes when we are in the states. I know you are talking about the dry mix in the boxes but I just wanted to say that when I need something good (that I didn’t make) it is always Amy’s brand frozen mac & cheese. You can microwave it but we only do it in the oven. 35-40 min at 375 and it will totally fill me up, plus you get all the golden brown crispy crunchy stuff. My kids love it more than any other m & c from the store. We have it with a raw mixed-vegetable platter, usually carrot sticks, cucumbers, yellow peppers, & red grape tomatoes in the middle, which looks really pretty too :) Oh- Amy’s now makes a low-sodium version, which I like also but it is definitely not as crave-worthy as the original one. Way better than the box kind!! 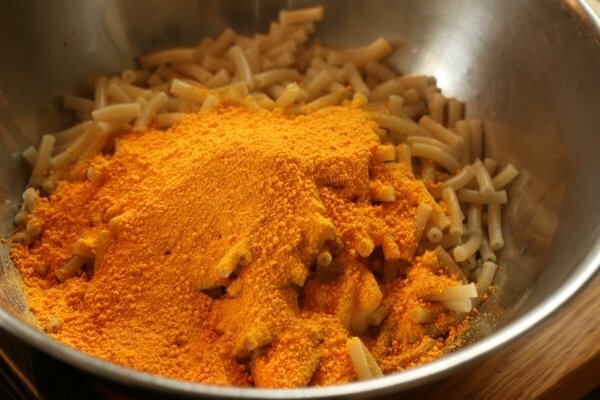 As a kid, I loved to put the Mac & Cheese 'cheese powder mix' on my popcorn. Memories . . . I have made Aldi's organic brand a few times in the past as they also sell the plain noodles separately and I add a cup of them to make it less cheesy for my grandson. Though I think his favorite it just plain noodles with coconut butter.